Serving the busy people of Western and Central Maine, A.E. Robinson Convenience stores feature everything you need to grab and go while heading out for your hectic day on the road. With ten locations throughout the state, we offer Irving Gas and Diesel at our clean and well lit pumps. Stop by and stock up for weekend fun. There are chips, cookies, cold drinks, and all the groceries you need to fill up your cooler. Need a boost of energy? We've got hot coffee to help chase away those chilly mornings. Visit our selection of beer & wine or one of our beer caves where every six-pack is chilled and ready to go. For those long road trips or early morning starts, fuel up your body at our Country Cafe. With breakfast sandwiches, pizzas, subs, salads and wraps to choose from, there's something for everybody in the whole family. 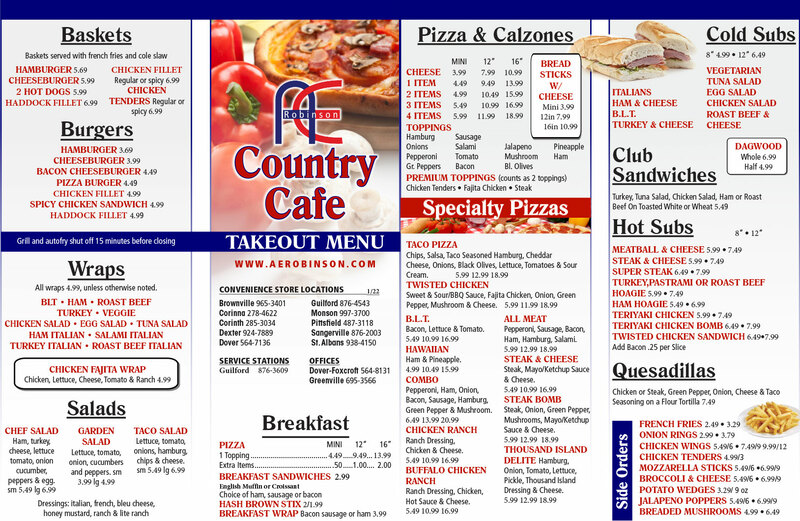 Take a break from the open road and enjoy your meal with our dine-in menu. Before you leave, check out our other services including lottery tickets, ATMs, and propane fueling station. A.E. Robinson Oil Company Inc was started in 1950 by Alfred E. Robinson, the father of the Company's current President. A.E. Robinson Oil Company began with one delivery and one service truck, along with delivering heating oil the company provided burner service to both residential and commercial customers. As technology continued to advance so did A.E. Robinson Oil Company. In 1970 James Robinson, Sr. "Jim" purchased the company from his father, which at that time had two delivery trucks and two service trucks. Jim (president) and his two brothers (now retired) ran the company all working in different areas of the business. As the company continues to grow it becomes more family based, with Jim's children, grandchildren, and nephews working in the company. The winter months are the busiest months for delivering heating oil and selling and servicing heating equipment. In the 1980's to keep business going year round A.E. Robinson's began purchasing service stations which were eventually turned into gas stations with convenience stores and deli's. April 1987 the flood of Piscataquis County created a lot of work for A.E. Robinson Oil Company. The River had overflowed its banks 11.6 feet above flood stage and filled the A.E. Robinson Office at South Street with 62 inches of water which ruined some paperwork and tools. The Main Street Mobil service station ended up losing two underground tanks and took a whole year to replace the tanks and repair the bridge. Over the years A.E. Robinson Oil Company has acquired more service stations and converted them into convenience stores, there are ten total convenience stores and service stations today. In December 1993 A.E. Robinson's acquired a Dexter Oil Office from RC Whitney. With the acquisition of this location it enabled A.E. Robinson Oil Company to better service their customers in the Penobscot County area. In 2004 A.E. Robinson Oil Company had outgrown the South Street Office and moved into their West Main Street Location which houses the main office, a parts and lubricants warehouse and a bulk propane storage tank. In 2005 A.E. Robinson Oil Company expanded servicing area by purchasing DW Cash Fuel in Greenville Junction and opening their Office in Greenville Junction to deliver fuel and service heating equipment. In 2007 A.E. Robinson Oil Company purchased the RH Foster fuel oil business and bulk plant facility; the office currently resides in Greenville beside Hammond Lumber. A.E. Robinson Oil Company now has 3 office locations in Dover-Foxcroft, Dexter, and Greenville; all three locations have bulk plant facilities with propane in Dover-Foxcroft and Greenville. In the summer of 2009 the Union Street Bulk Plant Facility was rebuilt to be in compliance with today's regulations. The larger storage helps A.E. Robinson Oil Company serve our customers better. In the spring of 2010 A.E. Robinson Oil Company added Plumbing as a service for our customers. A.E. Robinson Oil Company has a fully licensed Master Plumber who can service anything from a plugged drain or do a new installation in your home or business. Copyright © 2019 A.E. Robinson Oil Company. Design and Hosting provided by PHD Consulting, a Maine company.